WooHoo! It's fixed! No more Bedside Mode rants from this guy. Earlier today Rogers and Fido pushed out an over the air OS update to the BlackBerry Z10 that among other quality improvements and bug fixes, brought with it the ability to once again allow for Phone calls to ring while Bedside Mode is enabled and all other notifications are turned off. If you read our Z10 Review or listened to any of our late night live shows from CB's BB10 Launch Campaign Headquarters, you'll know I was bent out of shape over this feature not working as I needed it to on my Z10. Since Bedside Mode was first introduced in OS4.6 on the original BlackBerry Bold 9000, it has been a feature I have relied on every night since (if you're not familiar with it, watch this video). 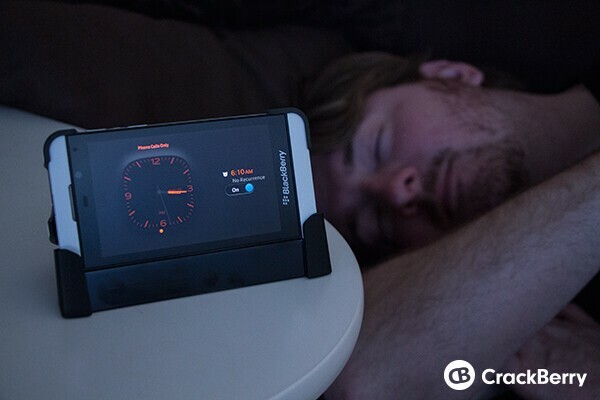 Highly customizable on BBOS phones, it gives the user the ability to easily turn their BlackBerry into a bedside alarm clock while providing additional control over to what sounds and alerts could come through while sleeping. The sweet spot of Bedside mode for me -- and pretty much every other Bedside mode user I know -- is to disable all notifications except for phone calls. If there's an emergency in the middle of the night and somebody needs to reach you, they need to be able to reach you. Period. In simplifying the user experience in BlackBerry 10, BlackBerry went a little too far in removing options from Bedside Mode, turning it into an All or Nothing scenario. In other words, you could have all your notifcations on or all of them off (phone ringer included) while the dimmed bedside clock was displaying. Simple is often better, but in practice this made Bedside Mode unusable. With all notifications on my phone is blinking and making sounds all night along. And with all notifications off, well, I wouldn't be able to hear my phone ring which I wouldn't be able to cope with. But that's all history and it's fixed before the Z10 hits US soils (maybe a silverlining to having to wait a little bit longer??). After today's update, my sleeping habits will be back to normal. Thanks BlackBerry! !